Hummus is probably my all time favorite “snack dip” besides Tzatziki. I love the creaminess, richness and incredible flavor that this simple dish can provide. 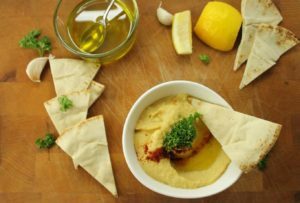 Traditionally a blend of Chickpeas, (also known as garbanzo beans), garlic, tahini (sesame paste) oil and lemon, Hummus is extremely versatile. This tasty dish originates from the Middle East, specifically Egypt and the Levant. Learning how to make hummus from scratch is super easy though, not to mention tasty! You can use it as a spread or base on a pita or naan pizza, as a dip for crudites, a healthy snack with some pita chips, your imagination is the limit here. You can even mix it in with mayonnaise and use it on sandwiches (if you haven’t simply substituted it for mayo already)! Hummus is full of fibre, proteins, vitamins B6 and C, and minerals such as iron, and zinc, making it a nice healthy way to start a meal or snack. Traditionally served and scooped with pita bread, you can garnish hummus with hard boiled eggs, paprika, parsley, cumin, cucumber tomatoes, the list goes on. Since hummus is so easy to make at home and freezes really well, I am always surprised when people buy it pre-fab at the store. You can pay five to six dollars for a little less than a cup worth of hummus, or buy a can of chickpeas for about ninety-seven cents. Lemon and garlic cost roughly a dollar or two, and I would hope you already have oil salt and pepper at home! So for about four dollars you can make roughly triple the amount of hummus that you would buy in a store. Making your own hummus from scratch also has the added bonus of giving you the option to adjust the seasonings, however you like! Love roasted garlic? No problem, simply toss in a few roasted cloves. You could even mix in some spinach and red peppers for an extra health boost. Different spices, herbs, vegetables, and nuts have all been added to hummus over the centuries, so let your imagination run wild! For this recipe, I am going to keep things fairly basic and simple, so that you can then take this base recipe and modify it to your own tastes. Think of it as a base recipe. Since I do not own an electric food processor, I am going to be using a simple little hand held crank one, that does the job just as well. 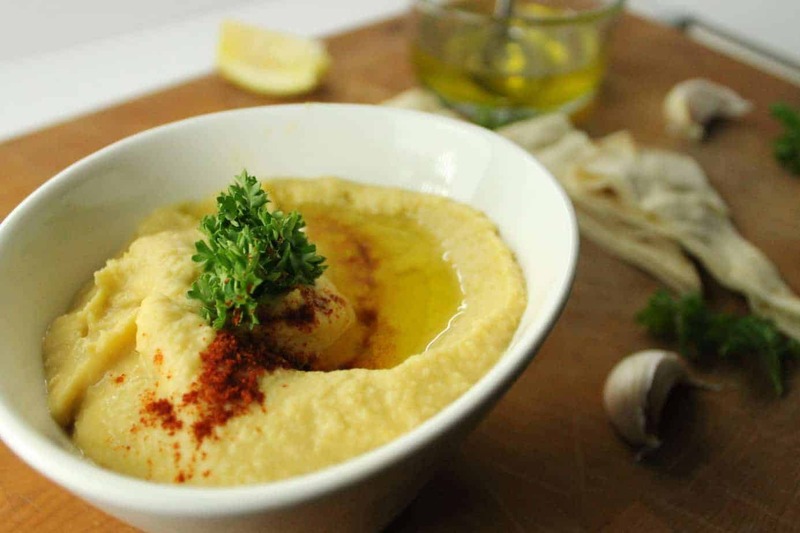 You can also make this hummus recipe in a mortar and pestle but you would need to crush all your chickpeas first and then add your oil at the very end. It does take a little longer to do this by hand, but don’t give up and keep going until your hummus is smooth! Start by draining all the liquid from your chickpeas and rinsing them very well under cold water. You can save the brine for future use (I’ll cover this in a future post) or simply toss it. It is just the liquid that the chickpeas were cooked in while they were processed. 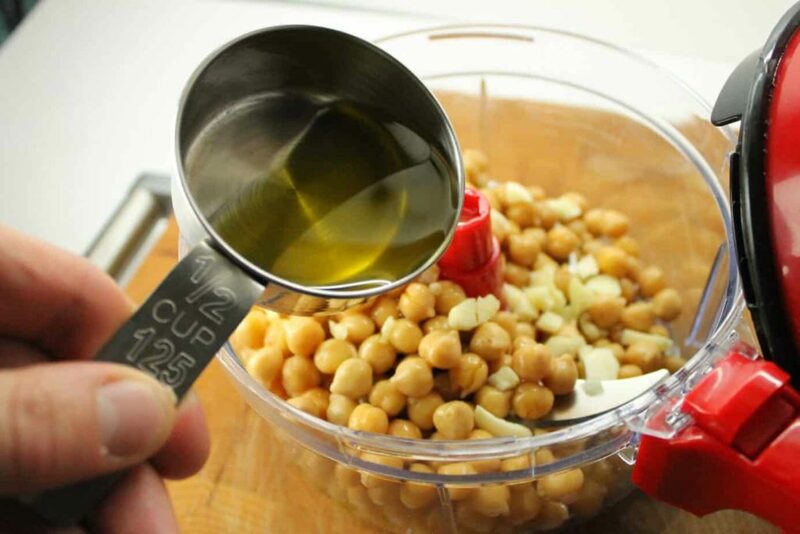 Once the Chickpeas are rinsed, add them to your food processor with half the oil, garlic, lemon and salt. Blitz them until the chickpeas are smooth. Once it starts getting a little harder to blitz the paste, add the rest of the olive oil to the mix and keep going. You could leave the paste chunky if you like or go for a completely smooth end product. The hardest part is over! To get the seasonings evenly mixed in I would suggest adding them right to the food processor from the start. If your hummus is too thick, simply add the rest of the oil to help thin it out. You can also add a splash of water if you like as well. As I mentioned above, you can easily add any other flavourings to the hummus at this point. Roasted red peppers are a popular addition, but try it with some cumin, coriander, and served it with sliced cucumbers! It’s simply delicious! 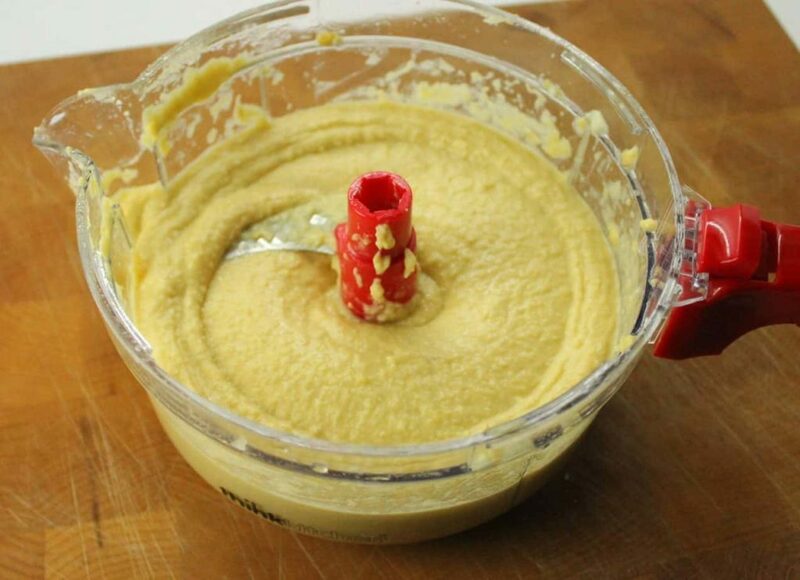 Learn how to make hummus from scratch with this simple 5 ingredient recipe. 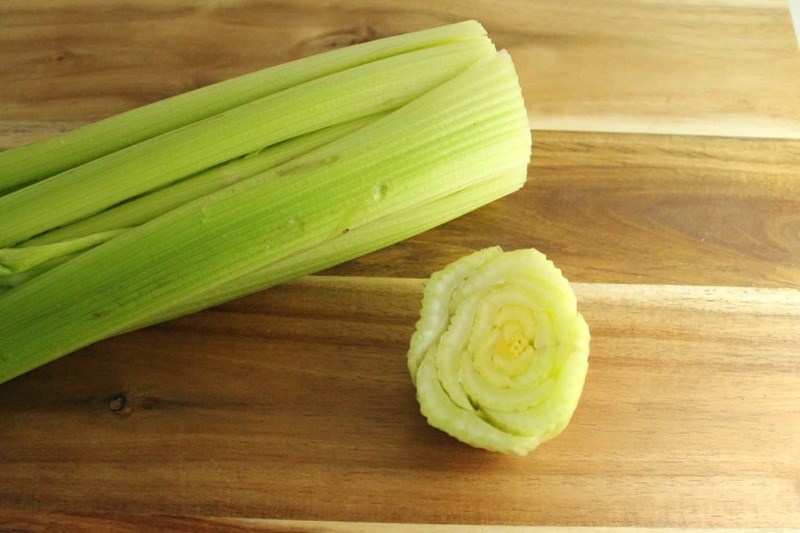 Easily modified to suit your own tastes & makes a great dip for crudites!! Strain the Chickpeas from the liquid in the can and rinse under cold water. Add the chickpeas, garlic, lemon juice, salt and half the olive oil to the food processor. Pulse the mixture until the chickpeas turn into a chunky paste. Add the rest of the oil and keep pureeing until the hummus becomes smooth. At this point add any other flavourings, such as spinach, roasted red peppers, tahini, roasted garlic, etc. 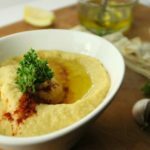 There’s nothing better than homemade hummus and I love your classic recipe. It’s something that will always disappear at any gathering. 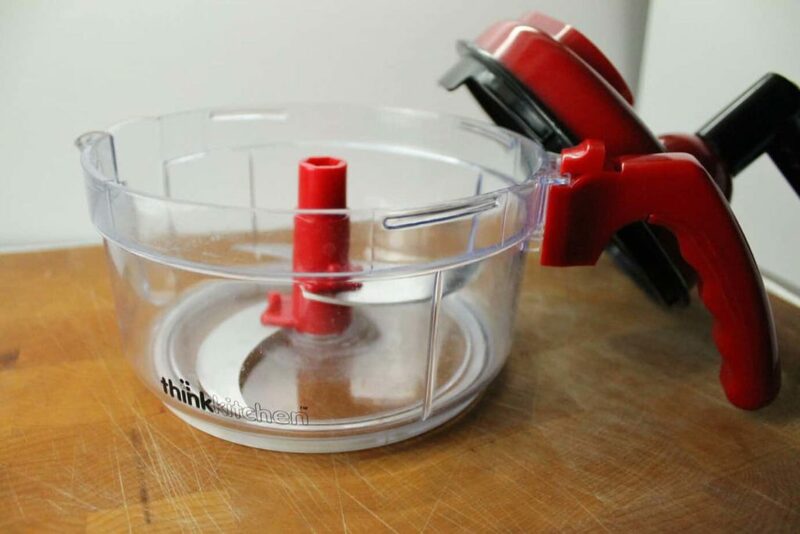 I also think your hand-cranked food processor is really cool. I haven’t seen one like that. I always whip up a big bowl of hummus for parties… It’s so easy to make, and everyone loves it. I love garlic, and usually use home grown garlic if possible! I could eat this stuff all day long! Hummus is such a great staple to be able to make. I spent too long trying to make it without enough olive oil, and that was always a mistake. Your recipe makes a perfect foundation, and one with endless possible adaptations. Great recipe, and fantastic instructions. Thanks! Using enough oil is key for sure! This looks great, Markus! I am pretty much obsessed with homemade hummus. It’s funny, I used to buy it all the time and thought it was great then. 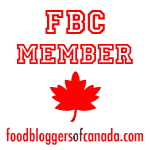 The first time I made it, I figured eh — good content for the blog. But honestly, the difference between homemade and store bought is incredible. Homemade forever — I haven’t bought any since! Love the simplicity in this one. Hummus really is amazing just as it was intended to be. I agree! Though I do love adding various flavors to it aswell the simple Garlic Hummus is still my favorite! Thank you! I’m glad you like them! Ive been learning alot about photography through doing this blog!